Prayer was the key to Padre Pio’s existence and the guarantee of his mission. Prayer was his daily activity. He also dedicated many hours of the night to prayer. It was the task which he felt was particularly his own and which drew upon him the attention of the whole world. At the altar, in his cell, or in the monastery garden, with his hands folded in prayer or holding his Rosary, his world was God – to be contemplated, to be praised, to be entreated, to be propitiated. More than anything else, his was a life of prayer, of uninterrupted conversation with God. 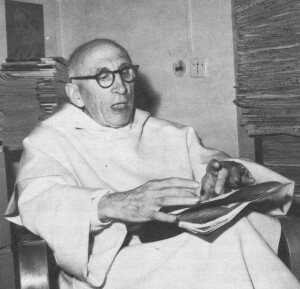 Father Denys Pierre Auvray, a French priest of the Dominican Order, visited Padre Pio for the first time in 1956. Father Denys was able to talk with Padre Pio during the Capuchins’ recreation period, when Padre Pio and the others took a short break from their busy schedules. Since Father Denys did not speak Italian, he spoke to Padre Pio in Latin. Among all the brown-robed Capuchins who were gathered together that day, Father Denys stood out in his long white wool Dominican habit. Father Denys was very happy that he had been able to talk to Padre Pio but he knew that it would be much better if he could converse with him in Italian rather than Latin. He also had a great desire to make his confession to Padre Pio. He decided to study the Italian language so that he could communicate freely with Padre Pio and receive spiritual direction from him. Father Denys made many return trips to San Giovanni Rotondo. When he visited, he frequently lodged at the Villa Pia hotel, not far from the Capuchin monastery. One afternoon when he returned to his room at the Villa Pia, he noticed that it was pervaded by a strong perfume. It had happened on more than one occasion and he became very concerned. He spoke to Luigi, one of the employees at the hotel, and voiced a complaint. “Someone is sneaking into my room when I am out and I am very upset. I always keep my door locked when I am away but I believe that a woman has been unlocking my door and going inside. I have proof because there is a strong scent of perfume that is still lingering inside the room.” In order to prove his point, he invited Luigi to step inside his room. Luigi explained to Father Denys that sometimes Padre Pio made his presence known by a wonderful fragrance. As he was talking to Father Denys, the room suddenly became pervaded with the strong scent of incense. “You see,” said Luigi. “Now we notice the fragrance of incense. It just so happens that Padre Pio is at the church right now presiding at the Benediction service.” The penetrating fragrance of Padre Pio’s perfume stayed in Father Denys’ room for the next fifteen days. During Father Denys’ visits to San Giovanni Rotondo, he met many of the people who collaborated with Padre Pio in his apostolic works. Dr. Guglielmo Sanguinetti was one of those individuals. Emilia Sanguinetti, the doctor’s wife, told Father Denys that she made it a practice to go to confession to Padre Pio once each week. On one occasion when she was making her confession, she noticed that Padre Pio’s face was swollen. There was also a small cut on his face. She asked him about it and he told her that the injury occurred when he was reciting the exorcism prayers over a woman who was possessed. At that moment, the devil struck him. Padre Pio told Emilia that if he had received the blow just a millimeter lower, it would have taken out his eye. At the monastery of Our Lady of Grace, there were generally always long lines of people waiting to make their confession to Padre Pio. Father Denys was impressed by the fact that Padre Pio met thousands of people in his lifetime, but he saw each person as an individual. He marveled at Padre Pio’s gifts of discernment and reading of hearts. Father Denys was speaking with Padre Pio on one occasion when he made a comment about the weather. “What is it about San Giovanni Rotondo? It certainly rains too much. It rains almost constantly!” Father Denys remarked. “Yes, it does rain a lot here,” Padre Pio replied. “But here it also rains the Asian flu.” Evidently Padre Pio could sense what was about to happen, because shortly after he spoke the words, Father Denys came down with the Asian flu. On one occasion, Father Denys sent his guardian angel to Padre Pio. It happened when he was preaching a retreat to a religious order of nuns in the seaside town of Biarritz, in the southwest part of France. During the retreat, he suddenly began to feel very ill. Worried that he might not be able to continue with the program, Father Denys prayed with urgency to his guardian angel. “Dear guardian angel,” he prayed, “Please take a message to Padre Pio for me. Tell him that I am very sick and I need his prayers so that I can recover. Otherwise, I do not see how I can complete this retreat.” To Father Denys’ great relief, he soon began to feel better and he managed to preach all the sermons in the retreat. Later, Father Denys wrote a letter to one of the Capuchins at Our Lady of Grace monastery. He explained that he had sent his guardian angel to Padre Pio and he wanted to know if Padre Pio had received the message. The Capuchin wrote back to Father Denys and told him that he had spoken to Padre Pio about the matter. Padre Pio said that Father Denys’ guardian angel had paid him a visit. Padre Pio hoped that Father Denys was feeling better and he had been praying for him ever since he had received the angelic message regarding his illness. From time to time, Father Denys was troubled by various health issues. He told Padre Pio that if the state of his health improved, he wanted to make a pilgrimage to the Holy Land. He had always had a desire to go there. “If I become stronger physically, I would like to go on pilgrimage in thanksgiving to God for the blessing of good health,” Father Denys said. “Of course, Divine Providence would have to assist me, because the expenses of such a trip would be enormous, far more than I would be able to afford.” Padre Pio listened to Father Denys but made no comment. One day, in the hotel dining room, Father Denys met a couple from Lebanon, Mr. and Mrs. DeChabert. Father Denys was enjoyed the fact that he could converse with them in his native French. They told Father Denys that they had come to San Giovanni Rotondo in order to ask Padre Pio for his prayers. Their son had died tragically in an accident in India just three months previously. Father Denys felt very sorry for the couple. He knew that it was almost impossible for the pilgrims to speak to Padre Pio privately. There were visitors at the monastery from all parts of the world. Almost everyone had a desire to speak to Padre Pio. The Capuchins were very protective and did their best to shield Padre Pio from the crowds. Because Father Denys was a priest, he had easier access to Padre Pio. He decided to speak to Padre Pio and see if he could arrange for Mr. and Mrs. DeChabert to meet him. That afternoon, Padre Pio presided at the Benediction service, just like he did every day. After Benediction, Father Denys told Mr. and Mrs. DeChabert to follow him into the sacristy. Padre Pio would be there shortly. When Padre Pio came into the sacristy, Father Denys introduced him to the couple and said, “Padre Pio, this is the couple I was telling you about. Their son died three months ago.” Mr. DeChabert had a photograph of his son, and he gave it to Padre Pio. 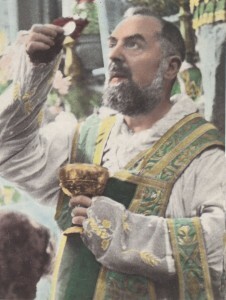 Padre Pio held the photo in his hand and looked at it in silence. Finally, he blessed it. Mr. and Mrs. DeChabert felt greatly consoled. Father Denys was astonished. He thought about his lifelong desire to visit the Holy Land and he remembered the time he had spoken to Padre Pio about it. He had the feeling that Padre Pio had something to do with the unexpected gift. In 1963, Father Denys traveled to the Holy Land for a three-week stay. Later, he visited Mr. and Mrs. DeChabert in Beirut, Lebanon. Before the trip to the DeChaberts’ homeland, Father Denys spoke to Padre Pio about it. “In that country, you will suffer,” Padre Pio said. Father Denys was not sure what he meant, but he would soon find out. The widespread poverty in Lebanon was very painful for Father Denys to witness. To see the privation and the hardship of so many people, caused him great suffering. To Father Denys, Padre Pio was a model of holiness for all people, both priests and laity. Whenever Padre Pio spoke about God, Father Denys always had the sense that he was speaking about someone that he had intimate contact with, someone that he knew very well. When Father Denys looked back on the many times he was able to visit Padre Pio through the years, he knew how truly fortunate he was. To Father Denys, every encounter with Padre Pio had been a time of grace. Nonce Gargano, who owned a furniture store in Marseilles, France, was a close friend of Mr. Bossi, who was one of his regular customers. Mr. Bossi used to visit Nonce at the furniture store almost every day. One day, Mr. Bossi asked Nonce if he had ever heard of Padre Pio and he answered that he had not. Mr. Bossi went on to tell him many facts about Padre Pio’s life and spirituality and encouraged him to make a visit to Padre Pio’s monastery in San Giovanni Rotondo if he ever got the change. Not long after that, Nonce’s twenty-six-year-old daughter Arlette became gravely ill. She was diagnosed with a very serious lung disease and had to be sent to a sanitarium which was almost two hundred miles from Nonce’s home in Marseilles. Nonce kept Mr. Bossi informed on Arlette’s condition. As the days passed, Nonce became more and more worried about his daughter’s health. Mr. Bossi could see the fear and anxiety in Nonce’s face. He gave him a picture of Padre Pio and said, “Take this picture of Padre Pio to your daughter and have her place it on her chest.” Nonce did what his friend suggested. He took the photo to Arlette and encouraged her to pray to Padre Pio. During Nonce’s visit, Arlette’s doctor asked him to come into his office. “I have bad news for you,” the doctor said. He showed him the x-rays of Arlette’s lungs. The cavities within her lungs had become more pronounced and had spread throughout both lungs. The doctor told Nonce that the only solution would be for Arlette to have surgery. A few days later, Nonce went back to the sanitarium in order to give his permission for Arlette to have the operation. He was greeted by the doctor and shown a brand-new set of x-rays. The x-rays showed that Arlette’s lungs were now completely normal. The doctor told Nonce that there was no explanation for the improvement. It was the doctor’s opinion that Arlette had received a miraculous cure. “Your daughter has been healed,” the doctor said to Nonce. “We have never before seen a miracle like this at the sanitarium.” Nonce was astonished by the news. He realized that it was the supernatural intervention of Padre Pio that had cured his daughter. In 1966, Nonce took his wife and children to San Giovanni Rotondo. His purpose for the visit was to thank Padre Pio for Arlette’s healing. Nonce was happy that Mr. and Mrs. Bossi were able to accompany them on the trip. After they found lodging near the monastery, Nonce learned that Padre Pio celebrated Mass each morning at the early hour of 5:00 a.m. He informed his family that he would not be attending Padre Pio’s Mass the next morning. It was just too early and he knew it would be too hard to get up. He would wait till later in the day to go to the monastery. Oddly enough, very early the next morning, someone knocked loudly on Nonce’s door and woke him up. He never discovered who it was. Since he could not get back to sleep, he decided to attend Padre Pio’s Mass with his family. That morning, the monastery church of Our Lady of Grace was full to overflowing. Nonce and his family were not able to find a seat and had to stand for the duration of the Mass. Nonce had not been inside a church in many years. He tried to recall how long it had been. He estimated that it had been fifty years since he had received Holy Communion. However, watching the way Padre Pio celebrated Mass made a deep impression on him. Afterward, he asked a man in the church if he knew how he might be able to speak to Padre Pio. The man told Nonce to go up to the first floor of the monastery and wait in the St. Francis room. Padre Pio would soon be going there to greet the visitors. Nonce and his three sons followed the man’s instructions. When they entered the St. Francis room, it was already crowded with men who were hoping to see Padre Pio. As Nonce waited, he silently repeated the only two prayers that he knew by heart – the Our Father and the Hail Mary. Nonce grew more and more nervous as the time passed. He began to tremble. He had totally neglected the practice of his faith for all of his adult life and suddenly began to feel very guilty about his actions. He had heard that Padre Pio could be severe with people who were not practicing their faith. Before long, Padre Pio came out of the elevator with two Capuchins at his side. When Padre Pio walked into the St. Francis room, Nonce instinctively knelt down. As Padre Pio passed through the crowded hall, his eyes came to rest on Nonce. He paused in front of him and looked at him straight in the eyes. Padre Pio’s gaze was so penetrating that Nonce felt overwhelmed. He could not find his words. All he could do was whisper, “Padre Pio.” Padre Pio then put his hand on Nonce’s head and gave him a blessing. That blessing and touch from Padre Pio changed everything for Nonce. He was never the same again. When Nonce and his family returned to Marseilles, it was not back to business as usual. They began to attend Mass together every Sunday as a family. In addition, they never missed a Holy Day of Obligation. It was like a completely new beginning. From that time forward, they visited San Giovanni Rotondo every year. They also found great inspiration in going on pilgrimage to the Marian shrine in Lourdes, France. Padre Pio too, was very devoted to Our Lady of Lourdes and encouraged people to visit the holy sanctuary. A painting of St. Bernadette Soubirous, the visionary of Lourdes, hung on the wall of his cell. In 1968, Nonce began to experience many difficulties with his furniture business. His store was impacted in a negative way due to competition from other similar stores which were springing up in the surrounding areas. Nonce decided to take his wife to San Giovanni Rotondo and seek the help of Padre Pio. In San Giovanni Rotondo, Nonce spoke to Brother Modestino and told him that he and his wife had come from Marseilles, seeking Padre Pio’s prayerful intercession. Brother Modestino was very familiar with Padre Pio’s schedule and was happy to help Nonce and his wife. He led them to a corridor in the monastery and told them that Padre Pio would be passing through the area in a short time. All along the corridor, women were kneeling. Nonce’s wife knelt down with the other women and waited for Padre Pio. Nonce soon saw Padre Pio as he came down the corridor. He prayed with great intensity, “Padre Pio, please give my wife a blessing!” Before he had even finished his prayer, Padre Pio walked straight over to his wife and blessed her. Nonce was amazed. When they returned to Marseilles, they both felt that they had received the necessary strength to face up to all their difficulties. Their prayers had been answered. There was a woman who used to go frequently to confession to Padre Pio. She was one of his faithful spiritual daughters. She had a strong, decisive personality and also a hot temper. She was well aware of her impulsive nature and her character weaknesses. She sincerely tried to make progress in overcoming her faults, but it seemed to be an uphill battle. On one occasion, the woman attended a religious play that was held in the church hall at Our Lady of Grace monastery. Padre Pio was there with all the other Capuchins to watch the performance. The hall was filled to capacity that evening. When the performance was over, Padre Pio followed the other Capuchins back into the church. The woman happened to be walking right in front of Padre Pio as he was making his way toward the church. Suddenly one of the Capuchins yelled at her in a rude manner, “Get out of the way! Make way for Padre Pio!” The disrespectful way that the Capuchin spoke to her was more than she could bear. The woman felt so insulted that she yelled right back at the Capuchin, “No, I will not do what you say. I am not in the way. You are a bad priest. You are full of bitterness!” The Capuchin became so angry at the woman’s words that his face turned bright red. Padre Pio was standing close by but he seemed to be wrapped in his own thoughts and did not appear to notice the incident. A few days later, the woman went to confession to Padre Pio. She confessed that she had lost her temper with the Capuchin priest when he spoke harshly to her. She said words to him that she now regretted and she was truly sorry for her behavior. Padre Pio listened carefully but remained silent. The woman waited for him to respond, but he did not. “Padre Pio, did you hear what I just confessed? I offended a priest. I yelled back at him and told him that he was a bad priest. I have committed a grave offense. I know that you were there when the incident happened but you seemed to be preoccupied with something else.” Again there was silence. Finally, Padre Pio said to her, “When you lost your temper and said those disrespectful words to the priest, did he answer you back?” “No, he did not,” the woman replied. “Did he say even one word?” Padre Pio asked. “No, he said nothing,” the woman answered. With those few words, Padre Pio wanted the woman to realize that the priest restrained himself even though he was very angry and even though he could have easily kept the argument going. With very few words, Padre Pio made his point. On another occasion, Padre Pio taught the woman an important lesson by once again using a few well-chosen words. He shocked her one day by asking her if she would give him a cigarette. She was so taken aback by the request that she could not even find words to answer him. “You know that smoking a cigarette is not a sin,” Padre Pio said. “That is true,” the woman replied. “It is not a sin, but it is a weakness. I do not want to give you a cigarette because I do not want to see that weakness in you.” “Exactly,” Padre Pio replied. “And I do not want to see that weakness in you either!” The woman got the message loud and clear. She gave up smoking cigarettes.